The Ritz-Carlton �, Marriott �, and Hyatt � trademarks are solely owned by the Ritz-Carlton Hotel Company, L.L.C., Marriott International, Inc., and Hyatt Corporation respectively; these trademarks are not owned or licensed by DownPillows.com. The Ritz-Carlton �, Marriott �, and Hyatt � trademarks are used on this website for descriptive purposes to inform DownPillows.com customers that the products featured on the DownPillows.com website are often found in these fine hotels. 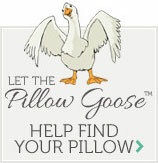 The products featured on the DownPillows.com website are manufactured by Pacific Coast Feather Company, United Feathers and Down, National Sleep Products, Pacific Pillows, DuPont, Invista and Phoenix Down. None of the products sold on the DownPillows.com website are made by or carry the logos of Ritz-Carlton �, Marriott �, or Hyatt �; however, Ritz-Carlton �, Marriott �, and Hyatt � regularly feature certain products sold on the DownPillows.com website in their hotels.